Wow!!!! It’s been ages since I posted at all In Sickness and in Health blog. It has been a year and about three months to be more precise. Guess what everyone; my new Neurologists have come up with a new diagnosis for me. In September 2015, I returned to my country of origin; Nigeria; where I did my best to get in touch with the best Neurologists in the country (Highly recommended and not cheap at all). They contacted my Neurologist in Ghana, run lots of tests all over again and came to the conclusion that I don’t have Stiff Persons Syndrome but rather Functional Movement Disorder. This was a very surreal experience for me. I had gone from Multiple Sclerosis diagnosis to Stiff Persons Syndrome and Myasthenia Gravis and lets’ not forget the Lacunar Infarctions the MRI scans showed. The major question was, what do I believe now? It has taken me about a year to come to terms with myself and I’m still coming to terms with the new diagnosis. It would be difficult to write down this ‘interesting’ journey all in one post. But I will be trying my best to put down my thoughts and prayers in to words and hopefully get some helpful comments from my readers out there. This last one year has been emotionally difficult for me because it just feels like; the rug has been pulled out from under me. I remember My Sister asked, the Neurologist last year; “Does that mean she isn’t sick?” and the Neuro answered, “She is”. My family had and still have no idea on how to cope with the ‘new’ me. Coping with Stiff Persons Syndrome was one thing; at least they could explain it and in some ways understand it. With Functional Movement Disorder, no one really understands it. I feel completely lost. I spoke to a dear friend, who advised I research on it and start learning to leave with it. So that’s what I’ve decided to do. It might have taken me more than a year to talk about it but I am now. I need to get better. I need to believe I can get better or at least be a better version of this “new” me. In subsequent posts I would explain what living with this illness has been all about and how I’m coping with the good and the bad and hopefully, not the ugly. “It’s not my fault” sounds like a such a simple phrase but difficult to accept and believe. A big part of me still constantly blames myself for falling ill. I feel like I changed the rules of the game in my family, by falling ill. I realize how difficult it is for them to cope with my health challenges. Some plainly refuse to accept it as if by denying it, the illness would cease to exist. Others just take it out on me. Apparently, I’m not doing enough, I should try harder. Trust me when I say this; I’m doing my best in this situation and in most cases I’m overdoing it. Which is what sets me backwards sometimes. I really did not wake up one morning and decide to fall ill or go to bed at night telling myself to fall ill the next morning. It just happened. This illness crept in while no one was checking and kept progressing to what it is today. Do I feel like my body betrayed me? Yes, absolutely! Can I do anything about it? That’s the question I need to answer. I know I’m really trying hard but I think the challenge is I’m trying hard to be normal. To be the person I once was. Maybe I need to let go of that person and embrace the new me. I just wish I knew how. Lord I need your strength to come to terms with today, to let go of yesterday and somehow find the grace to welcome my future by accepting the beautiful creature I am today. The Unpredictability of My Day! It’s really interesting how well a day could start and how downhill it could go. Today is a sample of a very unpredictable day. It’s 9pm over here and my nephew asked me “Auntie what made you so weak?” Let me just tell you about my day then. The rain or rather the heavy winds woke me up at around 7 am considering I just went to bed at after 4am. I was strong enough to make sure all windows in the house were shut, then I went back to lie down. I finally got out of bed around 9am, feeling okay, which mostly means in some kind of pain, unbalanced movements etc but manageable. It started around noon or 1pm, I can’t really remember. The back aches, mostly my lower spine; bending was really painful, sharp pains that affected standing, walking, sitting and even lying down. Then the pain started moving towards other areas. In about an hour or two, I knew this wasn’t going to be the great day I envisaged when I woke up. The dreaded spasms followed after 4pm, by then movement was totally out of the question. My eyesight had started giving out signs of blacking out. I prayed as usually do. Asking God to take control. I went thru my day with a fine comb, trying to figure out what went wrong. Did I take my meds too late, it couldn’t have been the heat because we had a cool weather due to the rain. I wasn’t the cause. My body just acted out without giving me a say on the matter. How do I answer my concerned nephew? My days, hours and even minutes could be really unpredictable but I have to live with it and make the best of the situation. God, please give me the grace to withstand the good, bad and the ugly, while finding a purpose in everyday. Its good to dream. How else do I keep hope alive? Lately, I’ve been struggling on the simple but complicated question of how to cope with what I’m going through. Reality check: my body is still at war with me, I’ve got the same family. They love me but mostly don’t understand what I’m going through and I’ve got no medical assistance. So for the past month, I thought about escaping from this. Contemplated traveling, visiting friends etc. But really, none of this options held a solution for me. Anyone I visit would be saddled with taking care of me. I can hardly leave the house alone . how then do I travel? Ive been so uncomfortable in my skin, irritable and quiet anxious. This last weekend I started to think like the old me. I want lots of stuff out of life, laughter, family, love, the ability to help people etc. I can’t escape the pains, the difficulty walking, the insomnia, weakness, irritability to touch. Thats as good as giving up, right?. I know it’s perfectly normal to want to run away from the pain. I’m human, it’s therefore a normal thought process. I have decided to learn to adapt. I recognize that the road to getting what I want from life would be tough. Full of ups and downs, highs and lows, but I have to go through. My assignment to myself is to write down the difficulties and challenges I face and figure out ways to adapt while still chasing my dreams. I’ll be writing on my journey as usual but more on how I’m learning to cope and I encourage lots of advice from everyone. Over the weekend, I spoke to the first native African I know diagnosed with Stiff Person Syndrome. Being an African lady with this illness, I had never met another. After all its a one in a million disease. I stumbled upon this fellow warrior and we got talking. It finally hit me; I’m not alone in this. Others are suffering and fighting back too. I can do it, I can keep fighting. I’m not alone anymore. That call gave me hope and strength to go on. To look at the situation with a different set of eyes. Thank you Lord for giving me the opportunity to meet others like me. Please give me the strength to keep fighting. To all those chronically ill. You are not alone. Diagnosed or undiagnosed, there are others like us. I’m here and fighting really hard to keep being here. A very interesting post written by Dr. Rob Lamberts in his blog Musings of a distractible mind, which has generated a lot of discussion around the web, as well as personal and touching stories shared by readers in comments. A must read for anyone suffering from chronic illness. Hold On or Give Up! I know this statement sounds harsh, but I guess some people would understand and a few might even agree with me. 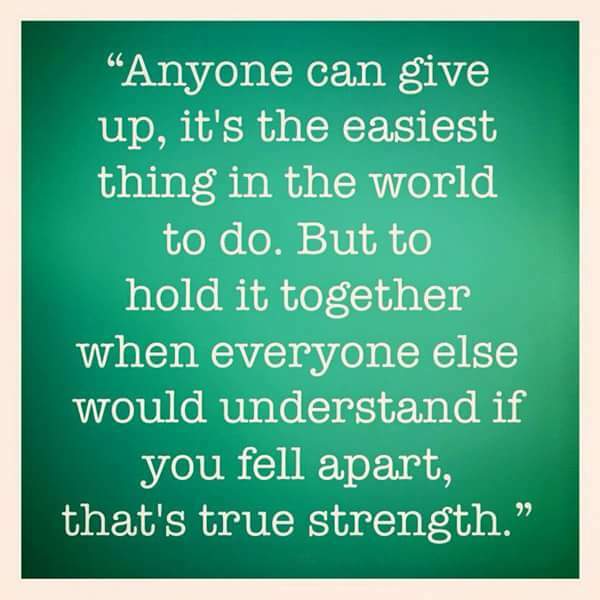 When giving up isn’t an option all I can do is Hold On! A dear friend advised me sometime back to come online and at least write or read blogs. I guess after I left the hospital something just went silent within me. Doctors were questioning my diagnosis, mental stability etc and it felt like too much. I needed a break from my head, my body and practically everything. I pulled away from friends and loved ones. I really felt like I had nothing to look out for and to top it off the hospital misplaced my medical file. I got better physically, I was taught how to handle the spasms better. But lately it seems like I’m having a setback. The symptoms seem to be returning. though some never left. Its getting harder to get out of bed. The pains that used to make me cry seem to be coming back. I had to go back to using my walking stick sometimes etc. The year is ending and as it has been for sometime now, i get caught in a dilemma towards the end of the year: between gratitude and ingratitude, doubt and hope. I wish i could go out whenever i feel like, spend time with friends etc but I can’t. I can’t go to my garden and I cant cook or bake in the kitchen but I am grateful to be alive because i believe LIFE is the greatest gift to humanity. So, if anyone asks me or wants to know how im doing? I’ll just say- “I’M HANGING IN THERE”. I was 30 on the 30th of July. Which is really great. I’m grateful to be alive. The downside was that, I spent it hospitalized. A birthday, I was looking forward to but I must confess with mixed feelings. Little did I know it would be spent in a hospital bed. I got cakes and cards, I did my best to focus on my blessings that day. I am alive. I can see hear and talk. I could taste a bit of the cake and some of my loved ones were around. It obviously would be a birthday, I would never forget and im grateful to all those who made me smile amidst the challenges I was facing. Thank you Lord for always being with me even and especially in situations I don’t understand. I’ve been at my lowest point healthwise for a while now. Till I get my strength back it might be difficult to coordinate my thoughts together to write. All I’m doing right now and for the past few days is just HOLDING IT TOGETHER. I’ll appreciate as much prayers and positivity I can get. mechristandchronicdi… on A Different Diagnosis!!!! Fibronacci on A Different Diagnosis!!!! KDKH on A Different Diagnosis!!! !